This spring should reward plenty of star-gazers, especially in Britain, which will experience its deepest solar eclipse in 15 years, as well as a Supermoon, all at the same time – an event that will sink the island into twilight for two whole hours. The Supermoon eclipse, as the phenomenon is known, is an astronomical alignment where the Moon is sent on a trajectory between the Sun and the Earth, depriving us of light. The event will occur on March 20 at around 8:40GMT. Scotland will have it best though, with a whopping 98 percent of the sky darkened, compared to about 85 percent for the south of England. For best results the Scottish need to look up starting 9:36 am. Other areas in Britain will only get around 30 percent. 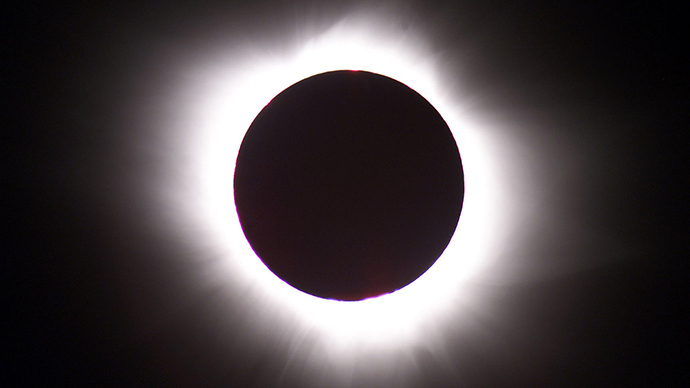 Similar events took place in 2006, 2008 and 2011, but neither of them can touch the upcoming Supermoon eclipse, except an event that occurred in 1999. We’ll have to wait three years for the next one in 2018. However, only 2026 will present us with a deep solar eclipse once again. As for the magnitude, it won’t be until 2090 that we get to see anything like the 1999 and upcoming March 20 events. Whenever particularly striking displays take place, it is because the Moon is close to the Earth. According to Dr Edward Bloomer of the Royal Observatory at Greenwich, the March eclipse will see the Moon closer to us than it has been in more than 18 years. “The Earth is orbiting around the Sun and sometimes is slightly closer and sometimes further away, and the Earth is also wobbling around on its axis,” the Telegraph cites him as saying. “Likewise the orbit of the Moon around the Earth is elliptical and slightly tilted so it’s rare for the Sun, Earth and Moon to actually line up,” he also said. And when the Moon’s orbit is as close as possible to the Earth’s, we have a total eclipse, Bloomer explains. That’s when the Supermoon appears, and that is what will take place in Britain in a few days, as our satellite appears to us as an enormous black, glowing orb, shortly before March 20. The only thing the Brits have to worry about is weather. It can potentially ruin their viewing experience, with the possibility of clouds and rain. But if skies are clear, another treat for everyone will be the moon itself. With such proximity and lighting conditions, a pair of binoculars will give the viewer surface details that could never be seen with the naked eye. However, it’s not just the fun factor of such events that is attracting attention. The Brits are afraid it might cause power grid failures as well. The National Grid says around 50 percent of power will be lost throughout the morning hours later in March. But Britain will remain relatively unscathed, compared to its European neighbors, where up to 10 percent of energy is generated sustainably, meaning they depend more on the sun. According to the UK’s energy body, only 1.5 percent of power there is generated by solar panels. And since people will be going out in droves to watch the spectacle, energy consumption should drop almost at the same time the shortages will strike, it says. "Within 30 minutes the solar power production would decrease from 17.5 gigawatts to 6.2GW and then increase again up to 24.6GW. This means that within 30 minutes the system will have to adapt to a load change of -10GW to +15GW," said Patrick Graichen, executive director of the Berlin-based think-tank on renewable energy Agora Energiewende, as cited by the Financial Times. While the world is only hearing about the Supermoon eclipse now, energy companies have been preparing for the event for months in advance, some in Europe setting up contingency measures for extracting energy from other power stations. Experts predict that precautionary methods will only increase with time, as more solar energy becomes increasingly commonplace.